On the first day of the 2017 EC ITF-BELGIUM won 2 medals. In pre-arranged sparring Andreea Musca & Leen Walraeve won the bronze medal by beating Bulgaria in the first bout, losing from Norway in the second round by 2-3. Andreea also won a bronze medal in tul 4-6 degree, her first EC in this category as she only just graded last February. 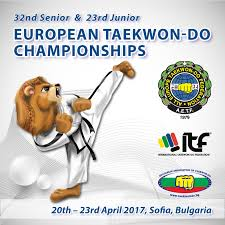 Good performances also by Leen in tul 1st degree and by Roeland Heirbaut in junior tul 1st degree, winning over Italy in his first bout and losing afterwards from Norway, the 2017 European Champion. Roeland is up against Slovenia in sparring tomorrow.